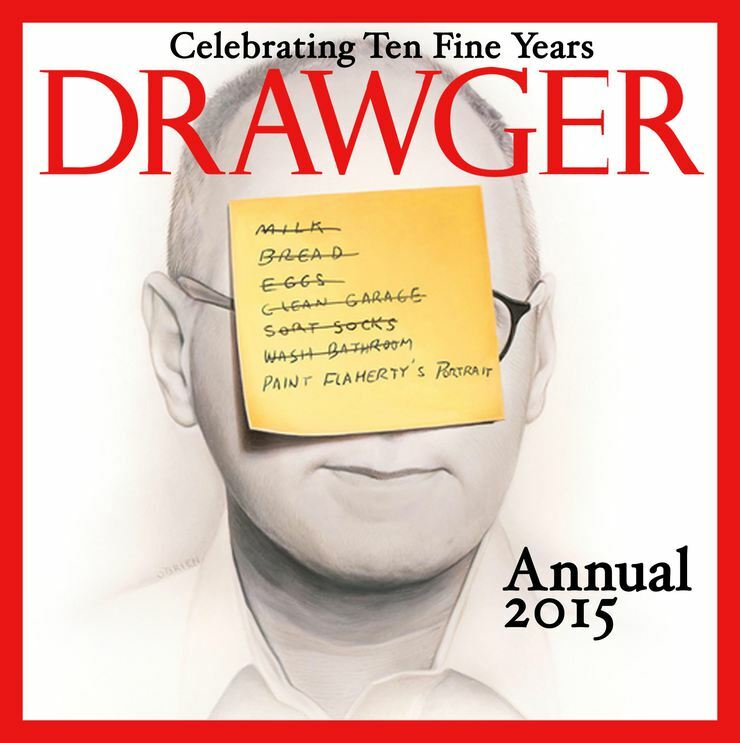 Pleased as holiday punch to announce the Drawger Annual for 2015! Hope you all enjoy the show! Many thanks to Tim O'Brien and Edel Rodriguez for saying "heck yeah"
Amazing artwork, they ought to do it professionally! That's a perfect Drawger Annual cover.Ten years!! Wow... ten years! I just went back to read my first post from March 2006. Thank you for Drawger, Robert. Happy holidays, sir! Tin/aluminum & diamonds for the 10th anniversary. Aluminum? who'd athunk. Thank you Mr. Zimm, I raise my tin cup. It's been a really fun and invigorating time these past 10 years to be able to post thoughts and images and see all the shared content. Inspiring projects, and trips and ideas. Reading about vacations, the passing of parents, the growth of children and of course the fun has been memorable. Cheers to all of the artists here now or who were once here and moved on. Felt like a job managing to get it posted with 10 minutes to deadline! Thank you Zimm, for the platform. Great cover! It's like being on a playground where the kids never get older, they just get better. I've loved being a part of Drawger. Thanks Zimm! Thank you Zimm, for 10 years of the greatest shared platform for illustrators anywhere. Thanks a lot Robert for this amazing and wonderful place that is Drawger! Thanks for putting this together Zimm... Love the poster. One of my favorite portraits EVER. Beautiful Timmy. I consider it a special honor to be part of the Drawger family. It has provided a platform not only for the images I create but for the opportunities to write and tell stories. Thanks Zimm. Wow, 10 years... I remember some of the "all time" late night posts when Flaherty was passed out, drooling on the his keyboard - according to Staake, or so it goes. What a riot those early days were!! Thanks for 10 years, Zimm. A serious honor to be a small part of such an amazing collection of wonderful artists. I'm riding in the caboose and Zimm is driving the engine!